The TGV (Trains a Grande Vitesse) are the express trains of France and connect the major cities of France as well as continuing through to other neighbouring European countries that border France of Luxembourg, Belgium, Spain, Italy, Germany and Switzerland. If you can, travel on the upper deck of the duplex TGV trains for a superb view of the countryside as you speed through at the maximum of 320km/h (199mph) or slightly slower on the older trains at 300km/h (186mph). All train times given here are the shortest time on a direct route. You can continue on to other cities from all these destinations. TGV Nord from Paris Gare du Nord. 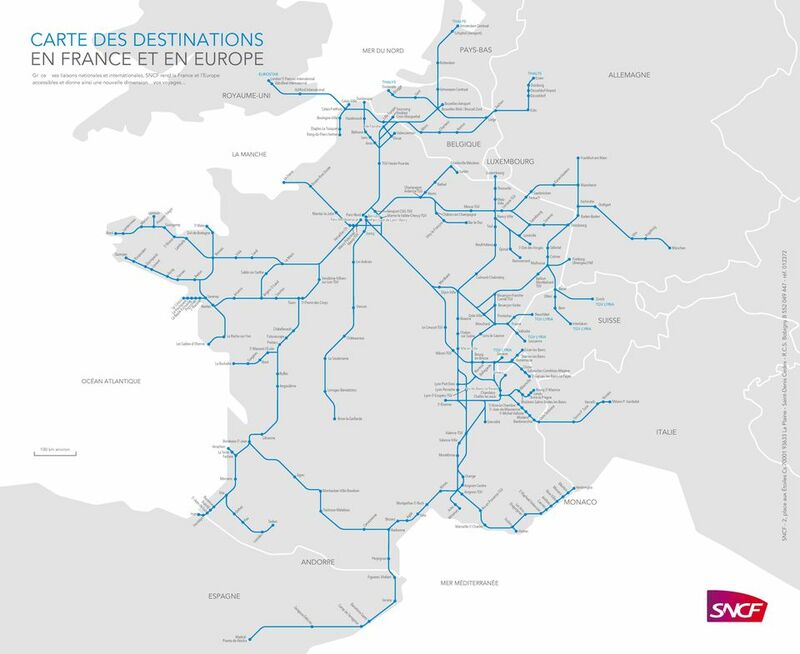 Connects to the north of France, to Lille, and Eurostar to London, Lille and Brussels. TGV Est from Paris Gare de l’Est. Connects to the east of France, one of the new regions now called Grand Est, serving destinations like Reims, Metz (visit the great Pompidou Metz Museum), Nancy, Strasbourg, Luxembourg and beyond. TGV Sud-Est from Paris Gare de Lyon. Connects to the south and east of France. TGV Alpes from Paris Gare de Lyon. Connects to the east of France and in winter is particularly useful for skiers, going on to Alpine resorts like Courchevel. TGV Méditerranée from Paris Gare de Lyon. Connects to Provence and the Cote d'Azur. TGV Atlantique from Paris Gare Montparnasse. Connects to the south and the west of France. Also try Voyages sncf (in French). Many but not all of the following cities are served directly by TGV express trains. With some of the following destinations, you will have to change from the TGV onto a direct express train to reach your destination. Some of the TGV stations are outside the main city, but there are always good transport links into the city. Some, like at Lyon, are beside the airport. All of the following articles contain links to Eurostar information from London to Paris, Lille and Brussels. In April 2015, a new service began from London to France. Various Eurostar trains leave at 07.19 and arrives in Lyon at 1pm (local time) taking 4 hours 41 minutes, Avignon at 2.58pm (local time) taking 6 hours 39 minutes. A separate train leaves at 07.19pm to arrive in Marseille at 2.46pm (local time) taking 6 hours 27 minutes.